This beer has now been in the keg for a week. Fermentation took about a day to start but was steady for around four days following that. As planned I attempted to control temperature with ice packs. The ambient temperature being around 21c, I wanted to lower that to below 19c. Ice packs are hardly an exact science and don’t provide a solution that’s repeatable, but I don’t have space for a fermentation chamber so you have to make do with what you’ve got. As far as maintaining a steady(ish), sub 19c environment for the yeast goes, I think I succeeded. The final gravity hit 1006 which is really very low for beers I make, the lowest I’ve ever had in fact. With an original gravity of 1045, this gives me a beer that’s around 5.3 per cent alcohol. Pulling a small sample from the keg revealed a very green beer - obviously. More importantly though, it’s pretty good! There’s a very subtle hop presence which is only detectable if you know what to look for and the bitterness is crisp but delicate. Considering the low final gravity, it’s not dry at all. There’s a distinct malt character that reminds me of honey and, more specifically, honeycomb; something that I’m assuming must come from the Optic Pale Malt. Importantly, there’s no yeast-driven fruitiness to speak of at all. 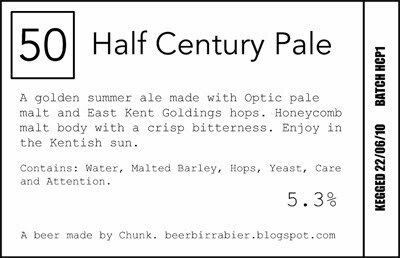 This flavour is typically produced by ale yeasts when they’re allowed to ferment towards the warmer end of their temperature range. The fact that the beer is missing this element suggests that the temperature control technique I used appears to have worked. Readers of the brew day blog post will know that I also aerated this beer before pitching yeast, it’s entirely possible that I reduced ‘stress’ on the yeast by doing this, helping further to reduce any fruitiness. As well as tasting too young, there’s still a lingering haze to the beer’s appearance. But with over three weeks until it’s needed, there’s plenty of maturation time for this to be resolved. Optimistic that this will turn out quite well. I've given up with US-05, I find it drys out my beers too much. I guess the lager drinkers will appreciate it though. Sounds like a nice beer. Thanks. :) The motivation behind it was to create something lager drinkers will like, so fingers crossed. 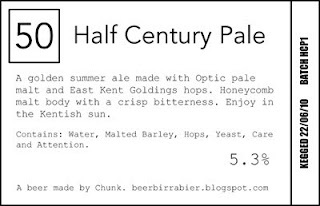 I brewed it for a 50th birthday party that's happening in July ... that's where the name comes from. 31 is more than me! I reckon (including kits) I'm probably somewhere in the 20s.